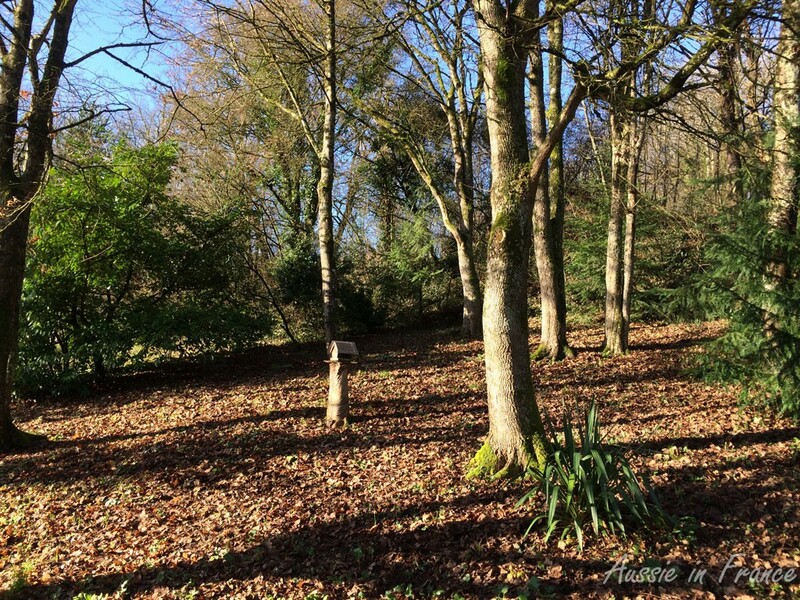 It’s Sunday, the sun is shining brightly, the sky is blue and it’s 8°C. We can hardly believe it after the awful weather we have been having since November. We begin with pruning the roses. We have ten climbing roses now and I’m still learning how to do it so Jean Michel explains as we go along. We are still feeling the aftermath of the terrible terrorist attacks during the week, starting with Charlie Hebdo and ending with four people being killed in a kosher supermarket in Vincennes very close to where I once lived, so a change of scene is welcome. 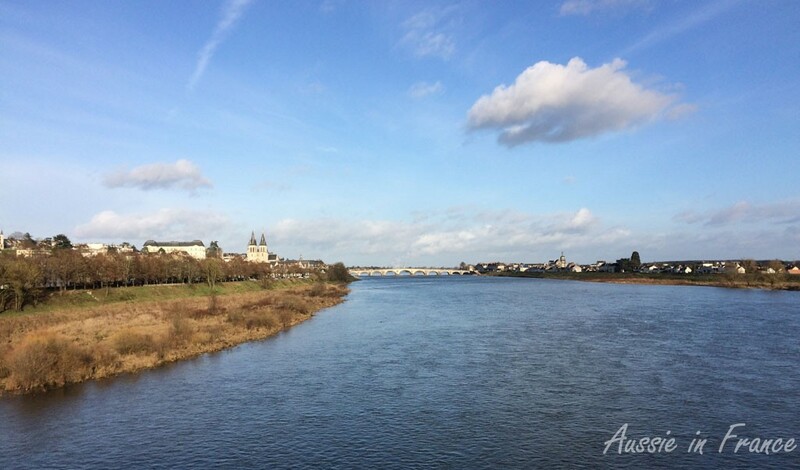 Whenever we go across François Mitterand bridge in Blois, I am frustrated because I’d like to take photos of the view but there is nowhere to stop before or afterwards much less in the middle. So we drive to the parking lot halfway between the François Mitterand and Gabriel bridges so that we can walk back to the bridge, cross it, then continue along the Vienne side to Pont Gabriel. 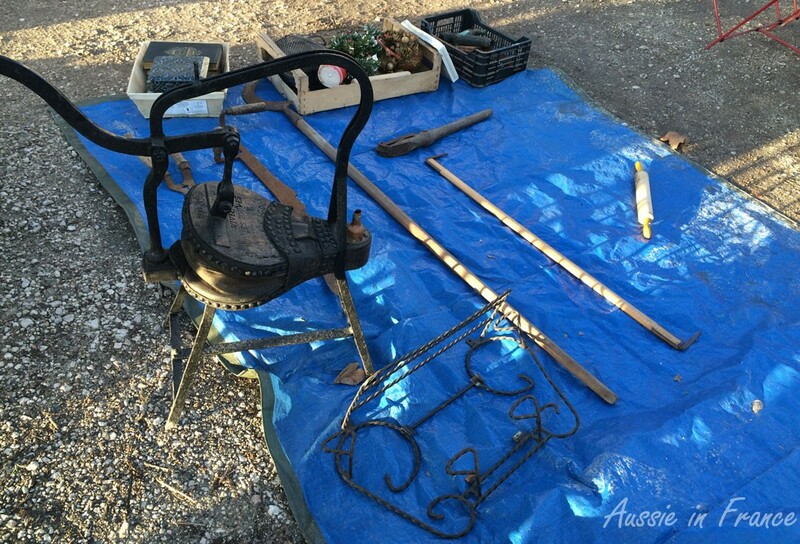 We’ll then cross over to the monthly brocante where we recently found andirons for our Renaissance fireplace. I take lots of photos of Blois as we cross the bridge (the sun is in the right direction) and another series as we walk along the river bank on the other side. We’ve often cycled here but it’s much easier to take photos when you’re walking than when you’re cycling! I love the brocante. I’m always amazed and intrigued by the things on sale. You wonder who would buy most of the stuff but I guess that the vendors only really need a handful of sellable things and the rest is just to fill up the stand. It’s still light when we get back home at 5 pm so we decide to treat the moss that is covering most of our grass using the dolomite we bought recently. Last year we bought a product from the garden store that burnt the moss but didn’t destroy it so this time I searched google for something more natural. We’ll see what happens. Jean Michel then goes to the kitchen to cook dinner. We have just bought two (dead and plucked) free-range ducks through our neighbour Alain. 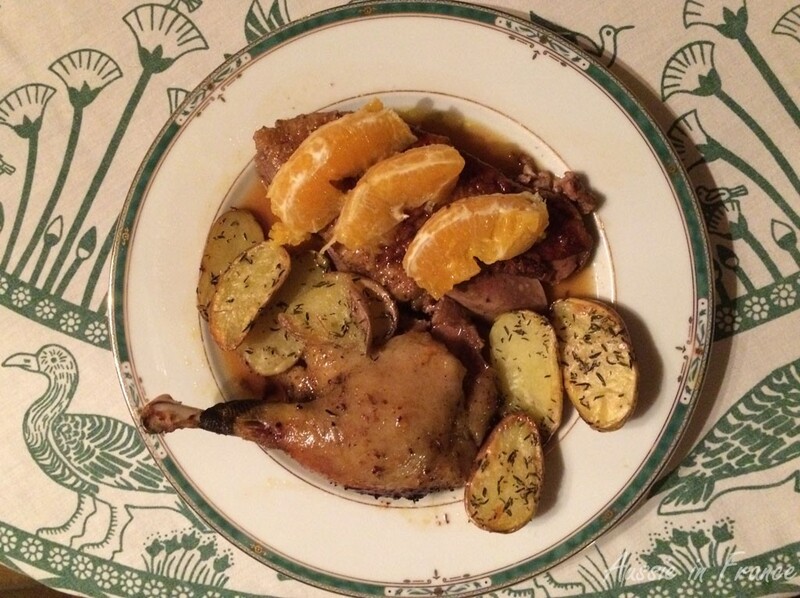 Jean Michel cooked one of the ducks last night for dinner with our next-door neighbours (the ones that bought the house with the poultry yard) using a recipe called the Arabian nights (1001 nuits) with various spices, nuts and dried fruit. It was very good. Up until Jean Michel’s retirement, I was the main cook with Jean Michel as my offsider. He also has a couple of dishes of his own (veal stew and rabbit) that he cooks occasionally in large quantities and then freezes. When we moved, I took over the everyday cooking with his occasional help when he’s not involved in renovation. I was not initially thrilled at the idea of doing all the cooking on my own because it’s not something I’m passionate about but I saw that I really had no choice in the matter and this retirement game’s too tricky to rock the boat too much … However, Jean Michel has spontaneously increased the number of times he cooks by himself and we now have a good stock of veal, rabbit and chicken dishes in the freezer that I can dip into whenever I want. Tonight he’s making the other duck into canard à l’orange which turns out to be very complicated and finicky so we don’t end up eating until 9 pm. But that’s OK. I have lit the fire and am enjoying not having to make the dinner! The breast is a little firm because it’s been cooked a bit too long but the drumstick is excellent and the orange sauce is delicious. I contributed the baked potatoes. The rest of the duck will go into freezer bags for shepherd’s pie (hachis parmentier). I’m happy he’s found a creative activity that’s also practical and he doesn’t seem to mind that it’s so time-consuming. Vive la retraite! 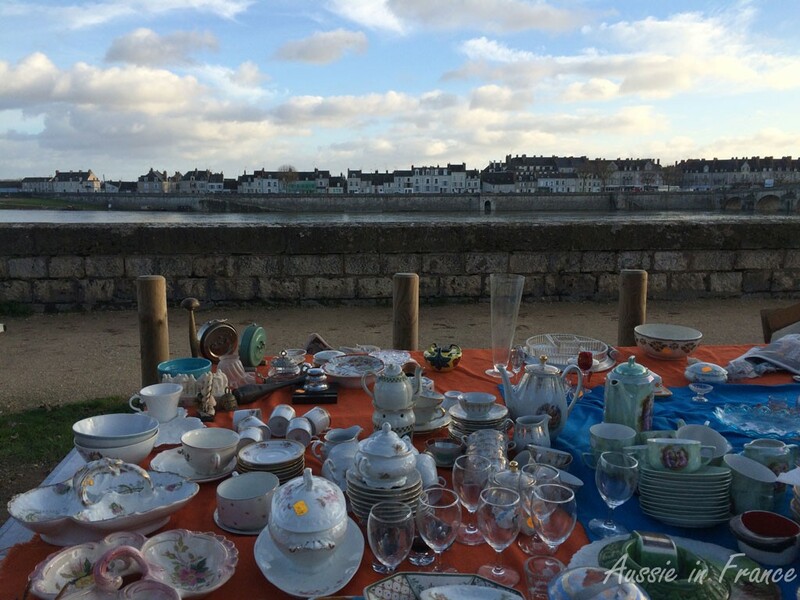 This entry was posted in Cooking, Country living, Flowers & gardens, Food, French customs, Life in France, Retirement and tagged brocante in Blois, retirement in France. Bookmark the permalink. Super. And he’s one of the few men I know who can be relied on to clean up after cooking. Yes, it’s true. He always cleans up. Thank you, Carolyn. I quite agree! Beautiful views of both sides of the river. A brocante would be the European equivalent to a flea market here. I really do love my town! Yes, it would be a flea market. 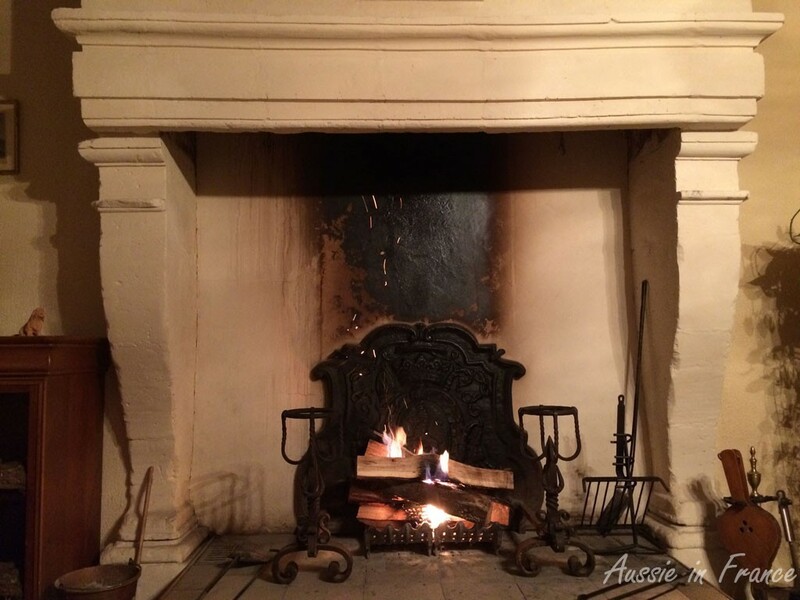 I just love this glimpse into your French life – buying ducks from your neighbor, your beautiful fireplace ablaze, and those delicious duck dishes your husband made! Quite impressive – the Arabian nights recipe sounds so good! Hi Sara, I’m so glad you find it interesting. I’m a little afraid of being boring … Isn’t Arabian nights a lovely title? I have to agree with Sara. It is wonderful to be able to have these glimpses into your daily life, always beautifully photographed and your writing is never boring! 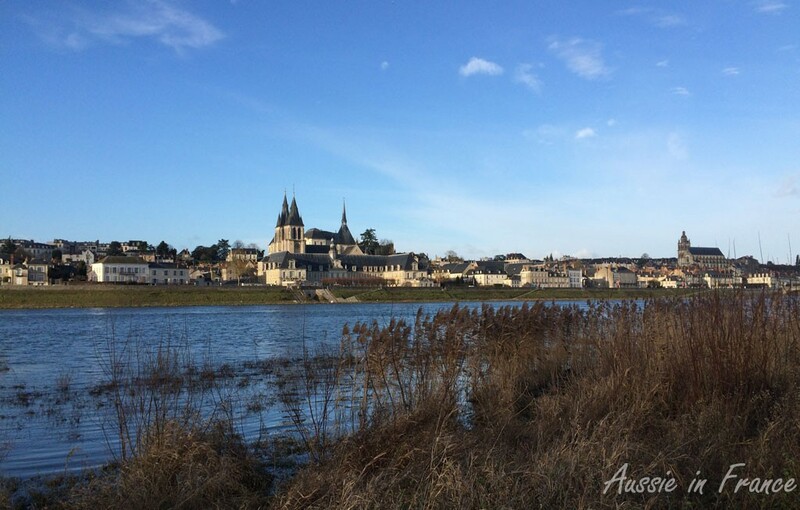 Your blog allows me to experience and see so much of the French countryside and way of life. I love Australia but it lacks the history, architecture, way of life and seasons of France. Even if I were able to visit for a short time it would be as a ‘tourist’. Your blog makes one feel a part of it all. Thank you, Helen, for reassuring me. I’m so pleased to share my life in France with readers in Australia. I am still Australian at heart, despite the fact that I have been living in France for so long, and having Australian readers who interact is very rewarding.